Sorry for the long hiatus. I was in overseas for a week and was rushing my work. I was working through the weekend. 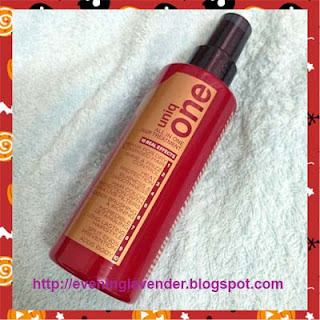 Before I go for my holiday break, I would like to share with you a hair product from Uniq1. The lovely people at Uniq 1 has sent me this product and I have been using it for 2 weeks or so. Uniq One is a product of Spain. It is fully imported from Spain under Colomer Group. I would say that this is a relatively good product. However, the product is only available in hair salon. I was lucky to be given the trial sample. Overall, I am happy with the product. My hair was permed in Dec 2012 and it is still curly. Therefore, styling my hair using this product makes my hair orderly and tidy. Although it does not provide a strong hold, it is relatively good. Usually, I used 3 pumps of this product and mixed with another hair styling product to achieve a medium hold. This product is very special because it is delivered using a spray nozzle. When I saw the spray nozzle, I thought it was a liquid product. 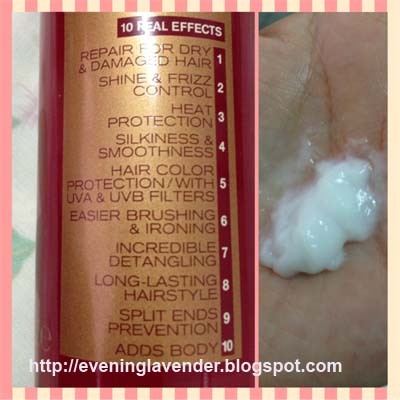 After using Uniq 1, my hair looks more glossy and felt soft. It is not oily and very easy to apply. I apply on damp hair and style according to my curls. I would rank this product 4/5. It is available at selected salons. Price: RM 95.00 per bottle (150ml).